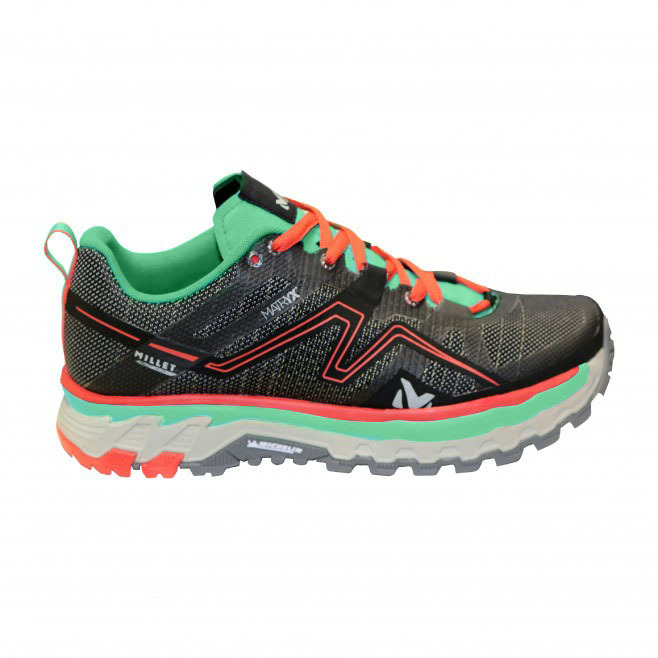 With its female-specific fit and dedicated women's colors, the LD ALPINE RUSH LTK trail running shoe - an OutDoor Award winner - is aimed at the most demanding women runners, who tackle rapid elevation change on all types of mountain terrain. An exclusive MILLET innovation, the MICHELIN Mont-Blanc outsole was developed on close conjunction with the world's leading tiremaker: it offers extra traction and stability on rough terrain and obstacle sections. Directly inspired by trail- and mountain-bike tire technology, the LD ALPINE RUSH LTK grips hard and insulates you from the ground. Maximized heel cushioning absorbs compression, and enhanced rebound reduces muscle fatigue. The superior strength of MATRYX, a French-made nylon/kevlar base which forms the upper's exterior, enhances abrasion resistance and makes the shoe deformation proof, while retaining optimized breathability and lightness. An additional hydrophobic finish delivers excellent moisture-wicking ability and ultra-fast drying during exertion.